Krishnanagar, Sept. 18: One person earned critical burn injuries when a mysterious explosion ripped off a part of the basement of a house located on a by-lane off DL Roy road in Krishnanagar on Monday evening. 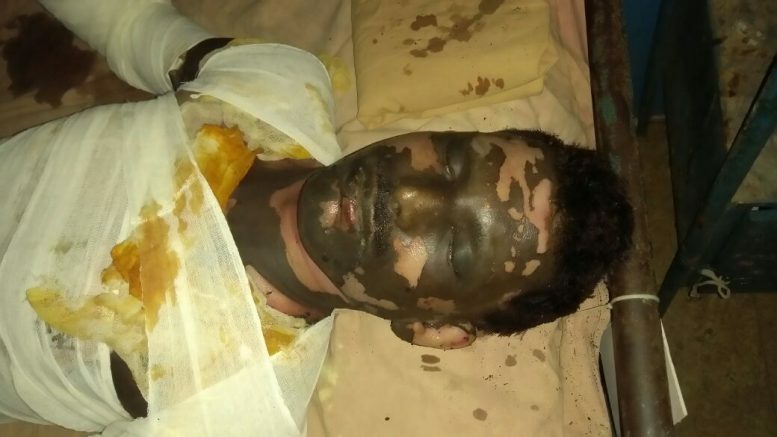 The injured person, identified as Goutam Das (35), a resident of Dhubulia who used to live in the basement on rent, was admitted to Saktinagar district hospital with 80% burn injuries. The blast triggered panic among the locals as its immediate impact was so strong that glass panes of the windows of the adjacent houses in the locality and of the rooms above the basement were shattered and walls suffered cracks as well. The reason behind the blast, however, remained shrouded with mystery despite the victim told police that he earned injuries as his mobile phone went off. The cops and the fire brigade officials, who rushed to spot after the blast, however, appeared to be unconvinced with the victim’s claim. Senior police officials visited the spot and locked the room for forensic examination which will be conducted tomorrow by a team of experts of CID. A fire fighting department official said: “There was no visible source found that could ignited the blast. There was no smell of any chemical. There was LPG cylinder inside the room, which also found okay”.